Non retracting banner stands are a great value and easy to use. Your graphic is removable and attaches to the stand in moments. 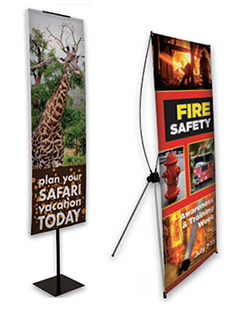 Compared to a retractable banner stand, non retracting stands are generally less expensive and lighter weight. They are also very popular when your graphic will remain up for an extended time, such as in a hotel or retail store. Our newest stand is our Eazy Pro Light. At only 7 pounds, it is a portable display that goes anywhere you are.